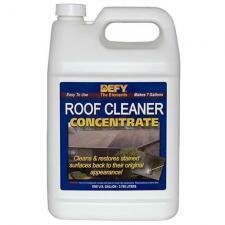 Defy Roof Cleaner is made of a blend of detergents and coupled with a unique buffered chemical made from sand soda ash. Allow cleaner to work for about 20 minutes and then rinse. Once the roof is clean follow with a treatment of Defy Stain Blocker.